Theresa May is expected to meet Jeremy Corbyn later after she said she wanted to work with the Labour leader to break the Brexit deadlock, BBC reported. Mr Corbyn says he wants a customs union and workers' rights to be priorities. But Tory Brexiteer Boris Johnson has accused Mrs May of "entrusting the final handling of Brexit to Labour". Jacob Rees-Mogg, another prominent Brexiteer, described the offer as "deeply unsatisfactory" and accused Mrs May of planning to collaborate with "a known Marxist". Mrs May announced her plan to meet Mr Corbyn - as well as her intention to ask the EU for an extension to the Brexit deadline - after more than seven hours of talks with her cabinet on Tuesday. BBC political editor Laura Kuenssberg says the latest move means the prime minister is likely to adopt a closer relationship with the EU - a softer Brexit - than she has agreed so far. Mr Corbyn said he was "very happy" to meet Mrs May and recognised his own "responsibility" to try to break the deadlock. But the meeting is not expected to take place before this afternoon, at the earliest, says our political editor, who was told by Mr Corbyn's team that he was not available on Wednesday morning for talks with the PM. If passed into law, the bill - presented by Labour MP Yvette Cooper - would require the PM to ask for an extension of Article 50 beyond that deadline. The UK now has until 12 April to propose a plan to the EU - which must be accepted by the bloc - or it will leave without a deal on that date. Mrs May said she wanted to agree a new plan with Mr Corbyn on the future relationship with the EU and put it to a vote in the Commons before 10 April - when the EU will hold an emergency summit on Brexit. 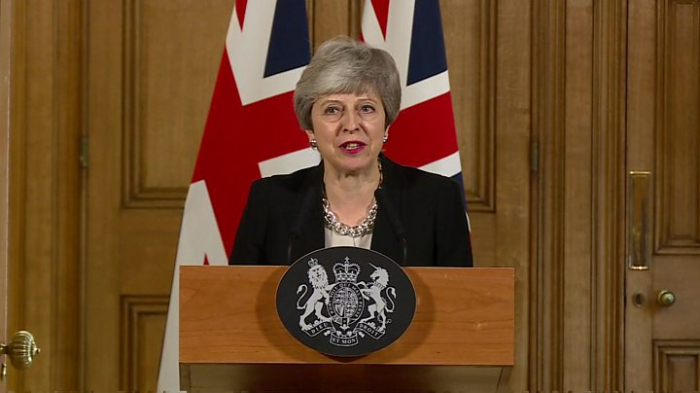 If the two leaders do not agree a single way forward, Mrs May said a number of options would be put to MPs "to determine which course to pursue". The final decision on a delay rests with the EU. The BBC's Europe editor Katya Adler said that its demands had not changed and it was "likely to put strict conditions on any further extension". European Parliament Brexit co-ordinator Guy Verhofstadt, who has previously said he thought a no-deal Brexit was "nearly inevitable", welcomed Mrs May's offer of talks with Mr Corbyn. "Good that PM Theresa may is looking for a cross-party compromise. Better late than never," he tweeted. But after her deal was defeated at the hands of Eurosceptics, in the words of one cabinet minister in the room during Tuesday's marathon session, she tried delivering Brexit with Tory votes - Tory Brexiteers said "No". Now she's going to try to deliver Brexit with Labour votes. In a way, it is as simple as that. Labour has previously said it has six tests for judging any final Brexit deal, including protecting workers' rights, establishing a permanent customs union with the EU and securing the same benefits of being in the single market the UK has currently. Shadow business secretary Rebecca Long-Bailey told BBC Radio 4's Today programme the two leaders must find common ground quickly. She did not rule out a confirmatory public vote on any agreed deal, saying only that Labour was approaching the conversations with "an open mind". Pressed on whether Labour would be looking to make changes to the Withdrawal Agreement, which the EU has said it was not willing to renegotiate, she said: "We need to examine all Parliamentary machinery." Andrea Jenkyns, a member of the pro-Brexit European Research Group, said she did not believe Mr Corbyn would work with the prime minister on a revised deal. "He just wants chaos and wants to get into Number 10," she told the Today programme. Asked what she would do in the event of a vote of no confidence in Mrs May's leadership, Ms Jenkyns said: "That takes a lot of thinking about." Northern Ireland's Democratic Unionist Party - which helps prop up Mrs May's government but has repeatedly voted against her deal - said: "It remains to be seen if sub-contracting out the future of Brexit to Jeremy Corbyn, someone whom the Conservatives have demonised for four years, will end happily." However, Environment Secretary Michael Gove, himself a leading Brexiteer, said he backed the talks with Labour because he "wanted to ensure that minds are concentrated so that we do leave".